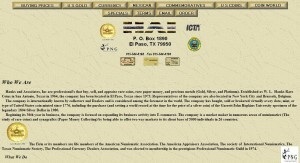 Hanks and Associates address, phone, website, and more. Hanks and Associates, Inc are professional’s that buy, sell, and appraise rare coins, rare paper money, and precious metals (Gold, Silver, and Platinum). 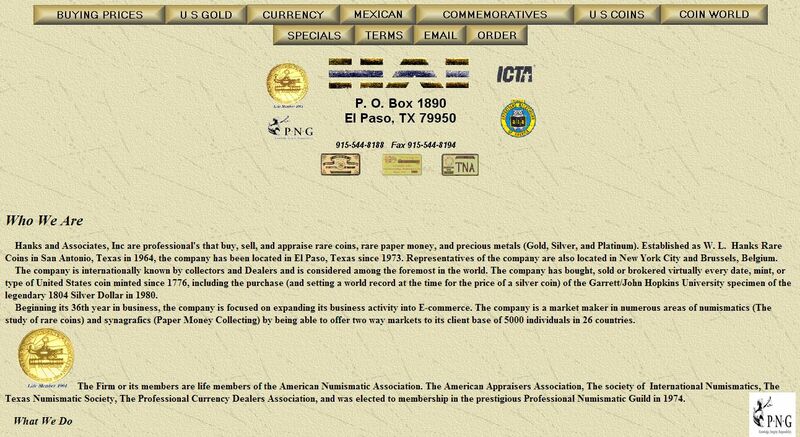 Established as W. L. Hanks Rare Coins in San Antonio, Texas in 1964, the company has been located in El Paso, Texas since 1973. Representatives of the company are also located in New York City and Brussels, Belgium. The company is internationally known by collectors and Dealers and is considered among the foremost in the world. The company has bought, sold or brokered virtually every date, mint, or type of United States coin minted since 1776, including the purchase (and setting a world record at the time for the price of a silver coin) of the Garrett/John Hopkins University specimen of the legendary 1804 Silver Dollar in 1980. Hanks & Associates, Inc. make purchases, sales, and appraisers of rare coins, paper money, and precious metals on a daily basis. All business transactions are kept in the highest confidence. The company specializes in the building of long term, high quality coin and paper money collections, whose owners are looking to learn about numismatics and gain or have appreciation for the historical and artistic merits of the property. We try to lead the collector along an educational path and to make it fun as well as financially rewarding. We will buy a single item, a lifetime collection, and an estate, a hoard or accumulation, pay quickly, and pay a fair price. Since we have a strong client base we constantly need a supply of new material to offer as well as new materials to service our want list.